As part of the emerging cluster of mid-rise tower blocks on the Fulham/Chelsea riverside border is a new joint venture between Berkeley Homes and the National Grid to redevelop the former gasworks on Imperial Road. 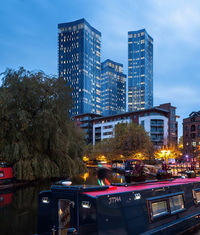 The construction cranes are soon to rise on what will be the tallest buildings ever built in the United Kingdom outside London, the Owen Street development in Manchester. 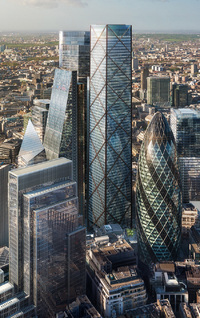 1 Undershaft, which will be the tallest building in the City of London, has been approved by the Corporation's planning committee almost a year after the building first surfaced. J.D Wetherspoon, the down-market pub chained famed for cheap lager, bad curries, and supporting Brexit, has made a major move into the Glasgow hotel market with a new proposal to sit on one of Glasgow's prime streets. Stage one of yet another attempt to build tall buildings off Bridge Street in Leeds has been submitted to the local council and features a re-clad of the former British Gas tower, once mooted to be demolished but still standing today. As part of the regeneration of the Fairfield Halls concert venue in central Croydon the local council is planning a massive development of the area around it that sees Croydon College included too. After a decade the planning committee at Poole Council has finally approved a specific development scheme for the Poole Regeneration Area that is commercially viable, rather than a small amount of affordable housing. 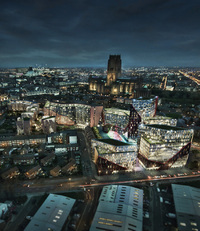 Piling is soon to begin on the largest development built in central Liverpool since the Liverpool One scheme, a high-tech version of Chinatown that looks like it escaped from Blade Runner. 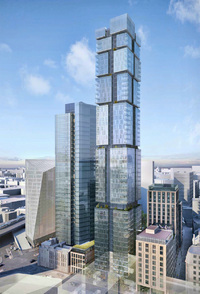 What could be the tallest tower in Newcastle Upon Tyne has been proposed by Stonegate Developments to sit on a site off St James' Boulevard, one of the main roads running through central Newcastle from north to south. 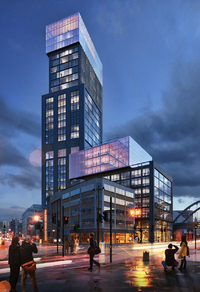 Another chapter in the rapid gentrification of Shoreditch looks like going ahead after the local council gave planning approval to what will be a 110 metre tall office/hotel tower located on Shoreditch High Street. At the peak of the last boom the architect Ian Simpson working for Westgate Properties came up with a proposal for Owen Street in central Manchester near the Deansgate Hilton which consisted of five blocks from 49 metres up to 150 metres in height which of course, never got built but was a symbol of the irrational exuberance that consumed developers eager to propose towers.